Welcome to House Cleanup And Decoration game Moreover all friends living together is all fun, but together cleaning home is more fun when house cleaning part comes along, also in vacation time you can help each other for there house cleaning in free time like summer vacation or winter vacation. So it would be in this house game. 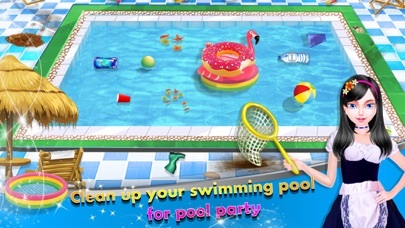 After playing this game you will be prepared for house cleanup and decoration. These house cleaning game contains rich set of levels, that includes : the bed room or parent room, kids room, the living room or hall, the bathroom, the kitchen, the play ground, the swimming pool and many more. This is the home cleanup game for who love to play house cleaning games with levels to make home sweet home. Never mess with your dream house. Cleaning house includes your way to clean rooms, hall, kitchen, bathroom, and the whole house cleaning. House Cleaning process includes many steps with easy house cleaning tips, Usually the house cleaning is done from top to bottom, in such a sequence i.e. first of all cleaning web made by spiders from ceiling, it might look even better and remove dust from house, Then Second thing we have to do is cleaning curtains, kitchen cabinets cleaning, floor cleaning and so on, you find inside this single game. A sweet home shows clean and neat but requires a some of time and energy. Don’t you want that your house looks good? You don’t have to wait for cleaning house! Celebrate a day as a "House Cleaning Day", clean up your house and get rid of the things which you don’t need put them in garbage collector like dustbin. Then, clean up all areas of your house i.e. bed room cleaning, hall cleaning or living room cleaning, kids room cleaning or children room cleaning, kitchen cleaning, etc. After that clean outside house such as Kids play ground cleaning, tree house cleaning, Garage cleaning and the main thing is swimming pool cleaning and decoration for enjoy summer pool party at sweet home. So buddies are you ready for an amazing challenge? In single house cleanup game, Help your mamma or BFFs to tidy up the house. Here you can straighten the furniture, lights and wall hangings, clean the cobwebs, rearrange items, as well as throw the rubbish away, scrub the stains, sweep the floors and so on. So that you can say it’s my house cleanup. 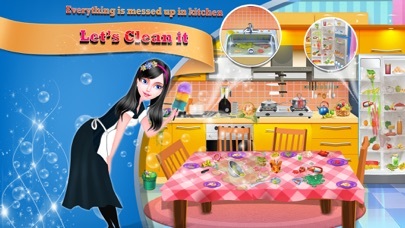 The Main feature of these game is cleaning process for every thing in a perfect home. Features are: - Full House Cleaning - Here you can clean house and then decorate it’s ceil and wall with set of colours - Living room Cleaning - Here you can play with TV, Wall Frame, Watch, and especially aquarium cleaning game - Bed room cleaning and kids room cleaning and tree house cleaning - Here you can make changes in furniture such as, wardrobe, drawer, windows curtains, night lamp and mainly the out side theme - Bath room cleaning - You can do that activities such as basin cleaning, Toilet cleaning and bath tub cleaning and flush water to clean it - Garage cleaning - Here you can play extra car cleaning activity - Play ground cleaning - Kids playground is the place where kids spent more time after with parents So it should be clean and clear - Swimming pool cleaning - Swimming pool must be ready for weekend pool party with BFFs and Family members Rest Feature : - Experience a wonderful gameplay - Free and easy to play - Full House cleaning for sweet home - Big House Cleaning game with rich set of activities Hope you enjoyed playing our House cleaning game and if you want more features for this game please leave a comment.